This morning’s return to a modicum of dollar strength is hardly surprising given the extent to which it has fallen against the Canadian Dollar which has been aided and abetted by problems in the German banking system and North Korea’s Elvis loving “Dear Leader” who has been throwing his nuclear toys out of his pram. With little in the way of fundamental news on the economic calendar for either the US or Canada today other than the CB Consumer Confidence Index the forex market will continue to take its cue from the wider commodity, equity and bond markets as well as geopolitical events. 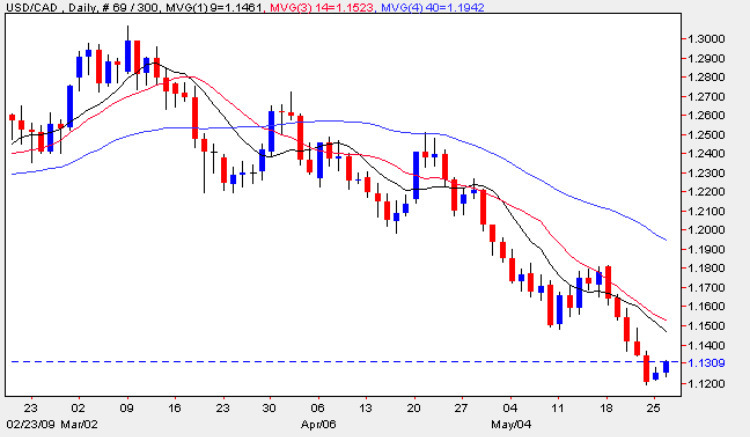 Yesterday’s candle was symptomatic of the day with markets closed both the US and the UK for a national holiday, currency trading was characterized by very thin volumes and narrow spreads and the usd/cad closed marginally higher from last Friday’s low of just below 1.12. Given the sharpness of the sell off in the US dollar we are likely to see a period of sideways consolidation, if not a short term reversal, and once again this should provide opportunities to enter new sell orders on any move higher on an intra day basis as we look to achieve our next target of 1.1.